BS2B reduces the ‘stereo fatigue’ one can experience when listening to music with headphones for extended periods of time. But how? When music plays from speakers in a stereo setting both of our ears perceive the sound waves from both speakers. With headphones, each ear gets one speaker to perceive the sound waves causing a slight overload for each ear. The idea is to use latency with crossfeed to bring the headphone usage closer to the stereo space created by listening to stereo speakers. This also lessens the load-by-ear mentioned above. A fracture of headphone users suffer from headaches and fatigue after listening to music with headphones and by enabling BS2B they are no longer experiencing said symptoms. What does BS2B have to do with Colibri? Colibri comes with a vast array of never before seen customization options. Use a global profile or downright assign custom made profiles to each and every song in your playlist. People seem to find there simply isn’t a one-size-fits-all solution to this – so Colibri gives you the freedom of setting crossfeed and cutoff values to your songs as you see fit. 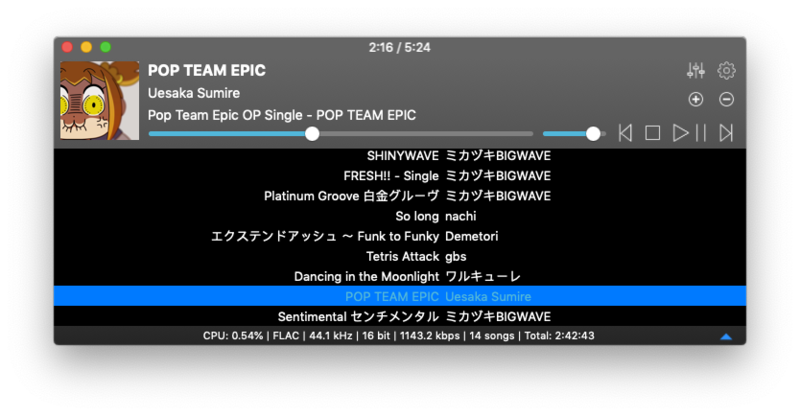 Having per song profiles and saved audio output data simultaneously would quickly lead to chaos. To prevent this, you can customize the Processing Order of BS2B data in the Settings – BS2B section. There’s also a textual representation at the top that tells you exactly what course of action Colibri will take regarding BS2B. What is Automatic Profile Switching? Remembering the values comes in handy when you switch your outputs. BS2B is not needed while you are listening to music on loudspeakers until you choose to use your headphones and select them as the audio output. At that moment Colibri will automatically apply and turn on the remembered values for your headphones. When you switch back, Colibri will also revert back to the corresponding device profile. Colibri represents a simple playback solution while hiding the required complex machinery under the hood. A Mac BS2B audio and music player that supports gapless playback with or without a Cue Sheet. Bit-perfect audio playback and accurate stereo-balance. If the song contains an embedded cover art then Colibri will happily display it as well – visit the Gallery to see more.